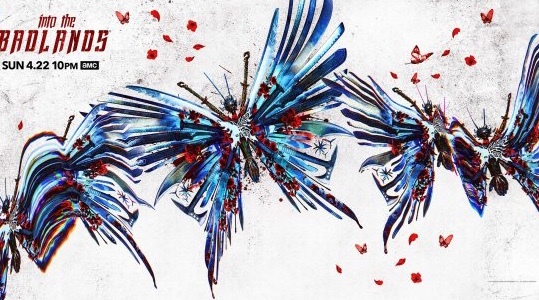 An all new season of Into the Badlands premieres tonight, with episode “Enter the Phoenix” on AMC 10/9 central! Last season ended with a lot of bloodshed, loss, and many of our favorite characters spread out across the Badlands. 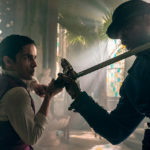 After spending all season fighting to be reunited his the love of his life, Veil (Madeleine Mantock) and their new baby son, Henry, the season 2 finale saw Sunny (Daniel Wu) face off against his former Baron Quinn (Martin Csokas). However, the fatal blow was dealt by Veil, who, in a move to save her family, sacrifices herself, killing Quinn in the process. 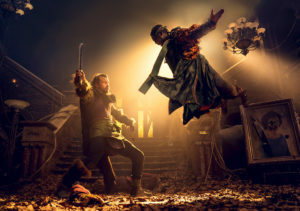 Elsewhere, Lydia (Orla Brady) escapes execution by Quinn’s men, MK (Aramis Knight) has lost his Gift, Tilda (Allly Ionides) and Widow (Emily Beecham) part ways after a fight over irreconcilable differences in which the mother nearly kills the daughter, and, in the final scene, Bajie (Nick Frost) sends out a signal to Azra before bleeding out from a stab wound. With so many things up in the air, in advance of tonight’s season premiere, I have previewed the first two episodes to give you the top 5 things (more like 4 and a bonus) you can look forward to this season! Sunny will do whatever it takes to keep Henry safe. 1. Sunny and Henry: Veil’s death outraged many fans. The fact that she had to kill herself to defeat Quinn was not only upsetting, but yet another example of a television fridging a woman for the male protagonist’s angst. In season 3, Sunny is doing the best he can to provide for his Henry, but he’s struggling with the weight of Veil’s death. Seeing Sunny as a dad opens up a whole new range of emotions for Wu to play with, and you’ll see Sunny just as fierce a protector for his son as he was as a Clipper. 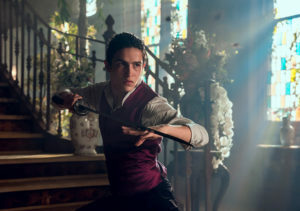 The premiere opens with the two off the grid, living on their own, but when Henry comes down with a mysterious illness, we will see our hero risk coming back into the badlands to do whatever it takes to help his son. 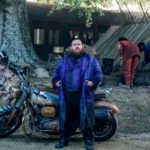 Fans of the Sunny/Bajie dynamic in season 2 won’t have to wait long for this unlikely duo to reunite, and we find out some of what happened to Bajie following the events of the finale. Widow looks to make key alliances to help her win the battle over the Badlands. 2. 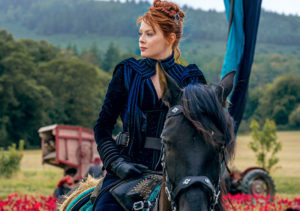 Old Friends/New Alliances: With both Waldo (Stephen Lang) and Tilda gone, the Widow is in need of a new regent, and she has her sights set on Nathaniel Moon (Sherman Augusts). If you’ll remember from Season 2, Moon was a former regent who wanted to either defeat or be defeated by the best. Instead, he lost his hand in his fight with Sunny, and now he still has unfinished business. Nathaniel’s not looking to be recruited, but Widow also isn’t looking to take “no” for an answer. While the Widow attempts to secure a strong ally to help her gain control of the Badlands against Baron Chau (Eleanor Matsuura), her daughter and former butterfly Tilda has started a new group of her own called the Iron Rabbits (I really want to be an Iron Rabbit). As “the Robin Hood outcasts” as Ionides refers to them, Tilda and her group hit up military caravans for food and supplies for the refugee camp run by Lydia. Don’t look for a mother/daughter reconciliation anytime soon. Tilda is determined to take revenge against Widow, and we can probably expect a big Butterfly vs Iron Rabbit showdown at some point this season. Pilgrim and Cressida set their sights on building their new kingdom. 3. New Players – Submit to Your Messiah: The Big Bad of Season 3 is Pilgrim (Babou Ceesay), a religious zealot whose goal is restore Azra and build his new kingdom upon it. 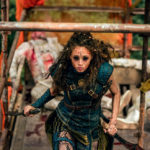 Up until now, Azra has largely been a myth and relegated mostly to the background as the first two seasons focused on the Barons and Sunny’s rivalry with Quinn. If the arrival of Pilgrim and his followers is anything to go by, there’s hope that Azra itself could become more central to the plot this season, as well as give us a look into the past (The place Pilgrim and his followers set up their camp holds a lot of “history”). Bajie sent out a message to Azra at the end of season 2, and it seems as if Pilgrim has come to the Badlands in answer to it. 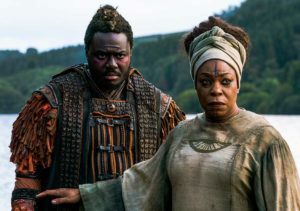 In our first look at him in the premiere, Pilgrim, joined by his prophet Cressida (Lorraine Toussant), dispatches two teenagers Nix (Ella-Rae Smith) and Caftor (Dean-Charles Chapman), gifted with dark chi, to take on one of Baron Chau’s heavily guarded checkpoints when the soldiers don’t accept his offer of salvation. We see more of the Pilgrim and his crew in the second episode, and while the first two episodes don’t do much to establish why Pilgrim is the Big Bad just yet (Is restoring Azra supposed to be a good thing or a bad thing? ), it does do a good job at establishing how dangerous this new group, and its leader, can be. Pilgrim battles a few unbelievers. In addition to the watch tower fight mentioned above between Baron Chau’s army and Nix and Caftor, Pilgrim shows off his fighting skills when he’s challenged by a few unbelievers. Sunny’s fighting to protect Henry now, so you can expect to see that reflected in his fighting style. MK has a lot to prove now that he’s without his powers, and he may find a new mentor in Moon. He may not have his powers, but he has a lot to prove. 5. (Bonus*) M.K. becomes relevant again: Speaking of MK… He started out as an integral part to the series seeing as how his relationship with Sunny as his mentor, his somewhat forbidden friendship with Tilda, and his dark chi connected to the mystery of Azra, acting as the bridge that tied the whole plot together. 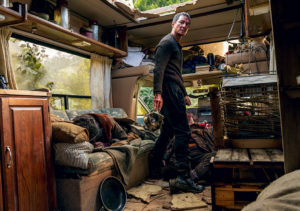 However, he seemed to be all but forgotten in season 2, separated from all the other main characters for half the season, stuck in the least interesting plot with the abbot. This season promises to bring MK back into the plot in a major way, with Knight teasing that he’ll become a “King of the Badlands” in the sense that many characters will want to have him on their side. Truthfully, he’s still not that relevant yet in the premiere. MK starts out in a bad place, depressed, self-destructing, and an unwilling “guest” of the Widow, who wants to force him to get his powers back so she can use him as a weapon in her war. Be on the lookout in episode 2 for a memory from MK’s past that will surely be a game changer for his story. The first two episodes skip the recaps and jump straight to the story, catching you up to speed on what happened to the characters since you last saw them and introducing new ones. Sunny’s arc will bring him in the path of 3 warring sides: Widow vs Chau, Iron Rabbit vs the Widow, Pilgrim vs Everybody, as well as an inevitable showdown with Nathaniel Moon, which means a lot of epic battles to look forward to in the fight for the Badlands. What are you most looking forward to seeing in the premiere tonight? Comment below! Tilda shows off the incredible costumes of the Iron Rabbits. Nix, a mysterious teenager with dark chi powers traveling with Pilgrim, gears up for battle.